Do I give too much of myself? YES, I do! I saw my mom do it, all the brown women in Queens do it, and all the people I admired in public service do it. So naturally, I give and give too. I love giving, but all this giving has left me feeling confused, bitter, and unbelievably tired. My time is worth more than I let on. I can’t control what other people do, but I can control how I DO ME, so I’m gonna refrain from giving too much away and start pouring more energy into me! What does more me-time look like? Crunching fall leaves, sipping chai, savoring fried bologna on buttered toast, watching reruns of Super Soul Sunday, and doing the running-man to Milli Vanilli’s Girl You Know It’s True. Easy, invigorating, and viable. Will you be willing to give more to yourself? Take all the time you need to get to your answer, and when you figure it out, jot down all your me-time magical activities so you that you don’t forget. Then, begin to plug each pleasurable activity into your calendar before the year ends. 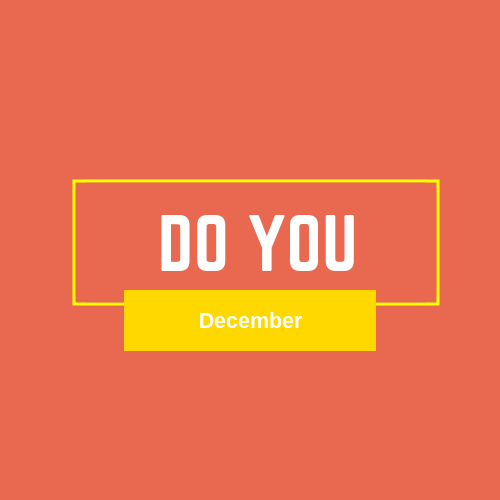 DO YOU December—a chance to give your mind, body, and spirit the attention it’s been yearning for. Consider this experience as the ultimate self-care treat designed to melt away your stress and help you refresh so that you can get back into your flow. Accountability with a one-week follow-up by email to ensure that you stay recharged and don’t drown [again]. If you’re ready to give more to you so that you’re no longer wiped out, contact me.